Vibe Lighting is launching the first edition of a unique LED lighting catalogue designed as the perfect tool for lighting clients to source LED products for new and existing domestic, industrial and commercial applications. Synonymous with style and quality, Vibe light fittings are supplied to a growing network of lighting retailers and hardware stores, electricians, landscape designers, architects and builders. 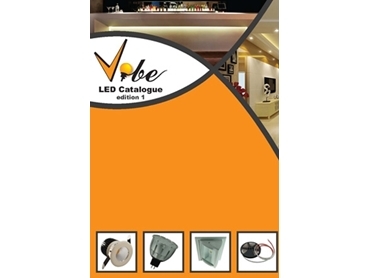 The uniquely designed Vibe LED catalogue contains comprehensive product details, codes, photometric data (where applicable), diagram measurements, product images, and available accessories and specification data. A web version of the catalogue is also available to meet the needs of online clients. A mobile device version is in production to accommodate those requiring product details on the move. Vibe Lighting Director Phil Hill explains that the catalogue gives their customers not only a diverse range of lighting products but also accurate content to enable them to make an informed decision on any product.The Vibe LED catalogue is available from ANL Lighting Australia Pty Ltd .